Heavy sudden floods are affecting again different districts of Herat and Badghis provinces in western Afghanistan after a very rainy March. Local officials told the local press that at least 20 people have died as a result of the rains that began Thursday afternoon and continue this Friday mainly in Ghoryan, Koh Zor, Rubat Sangi and Zinda Jan districts. 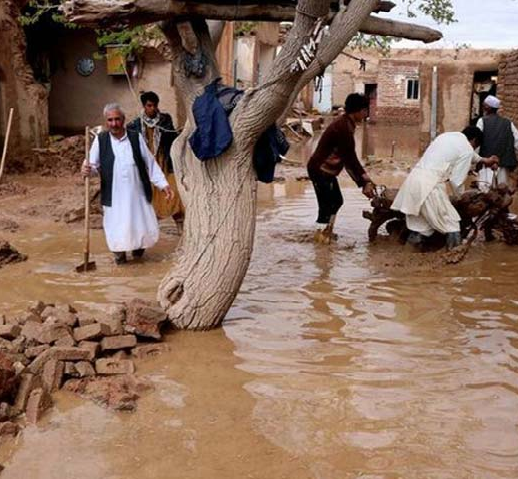 During the past month at least 13 people were killed by floods in Herat, while large areas of crops were lost and hundreds of houses were damaged. Inhabitants of this territory, since the beginning of the rains claim that the authorities have not paid the necessary attention to the complex situation they are in. Other provinces in southern Afghanistan, such as Kandahar and Helmand, have also been affected by this season’s downpours. A report by the United Nations Office for the Coordination of Humanitarian Affairs (OCHA) released in March noted that 4,698 households and more than 33,000 people require humanitarian assistance as a result of the floods in Kandahar. The Afghan Red Crescent and the International Federation of Red Cross and Red Crescent Societies denounced last week that ten million Afghans face serious food insecurity and need urgent assistance after floods and drought in the Central Asian country. This situation has become much more complex due to ongoing clashes between government forces and insurgent groups, as well as the political and social crisis in Afghanistan since 2001, when the United States and its NATO allies invaded the country.